ECU Joondalup striker Keylun Pollard was given his senior debut for the club and the 16-year-old helped the side to a 2-0 win against Perth Glory. Pollard, who has had a stellar season with the under 20’s was given the opportunity and he never let himself or the club down. He was happy with the team’s performance and three points were vital. “I thought we all played well as a team today and deserved the win,” he said. “We spoke before the game about being compact defending and going forward and it worked out well. The teenager said the senior players in the side helped him settle early, and he said after speaking to coach Dale McCulloch before the game, he was ready for a big game. “Dale asked me to a job both in attack and defence, and I thought I did OK. It’s good to have the senior players urging you on and it gave me a lift,” he explained. 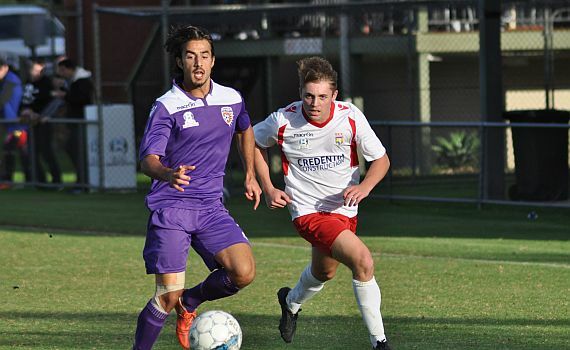 Pollard will be back in action on Saturday as the ECU under 20’s take on Perth Glory in the State League Cup Quarter-Finals and he said he is looking for a repeat result. “We will have a different side out for the cup game, but we need to keep the same shape and commitment and hopefully we’ll get the same result as the first team last week,” he said.